The home of free pdf and prc (mobibook) downloads for out-of-copyright books. Ideal for kindle, Sony reader, i-pad, blackberry, i-phone, android and other mobiles devices or smart phones. We offer Charles Dickens' books here for free download in pdf and prc format - just what's needed for students searching for quotes. Charles Dickens (full name: Charles John Huffam Dickens) is unquestionably one of the world’s most loved story tellers of all time and is often credited as being the greatest novelist of the Victorian era. Charles Dickens was born on 7th February 1812 in Portsmouth and left school early to work in a factory after his father was sent to a debtor’s prison. Dickens wrote extensively for a number of weekly or monthly journals with many of his novels being first published in serialised form. New readers of Dickens’ books have often noticed that chapters finish on a ‘cliff edge’ in anticipation of the next chapter which when first published would have formed the next episode. 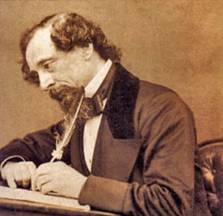 This approach to writing in part led to Dickens’ unprecedented fame during his own lifetime. In total Charles Dickens authored 15 novels in addition to hundreds of short stories and an extensive collection of non-fictional articles and open letters. In addition to his writing Charles Dickens was known for being a public advocate for children’s rights, social reform and welfare. Charles Dickens died aged 58 on 9th June 1870. A fuller biography is also available.